This week in the forest we have welcomed more new little friends into the Barnes family. Whilst some find it hard to say goodbye in the morning, they are all having fun filled days full of excitement as they explore their new environment. It has been fantastic to see how well they are settling in and getting involved in all sorts of activities in the forest. One day this week, the Little Forest Folk-ers set off on an adventure to find the Gruffalo’s house. When they found it, the Gruffalo wasn’t there! They discussed where he could be and decided that he had gone fishing. We all started to look for signs of where he could have gone and the children said that they might find footprints. Instead of footprints, they saw a long thin trail in the mud and we all decided that this must be his tail dragging on the ground! They followed it.... and as the trail stopped we noticed some breadcrumbs in the bushes, the children decided that the Gruffalo must be trying to catch the big bad mouse so they all ran away! 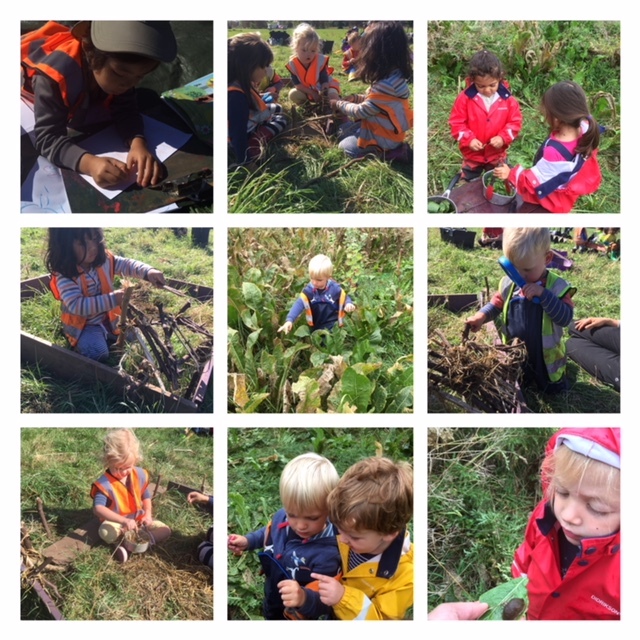 The children noticed that Mar had begun to build a pond using sticks. They headed over to help and started to build houses around the edge of the pond. They used grass, sticks and leaves tying everything together with dried reeds. Others decided to make their own fishing rods to use in the pond and catch fish! We also set up a shop one afternoon and our Little Forest Folk-ers quickly began to turn it into a restaurant. They cooked pizzas, cheeseburgers and eggs, whichever way you wanted. It was wonderful to see some of our younger friends totally immersing themselves in their roles and playing with each other for extended periods of time! We have also introduced our project work this week for the children who are of Reception age, we will be sharing what we get up to with our Jaybirds families in a special newsletter.